After Christmas we started to settle down to a quieter life. Barbara pays regular visits to her mother and stepfather, who are now in a nursing home south of Adelaide, about 1 and 3/4 hours drive from our place. Victor has got his computers set up into a LAN using wireless connection, which is great because he can use the laptop in any room or outside on the veranda, whilst still connected to the internet or to his other computers. We have heaps of kangaroos bouncing around on our hill, often clearly visible from our windows, our patio, or from the pool. 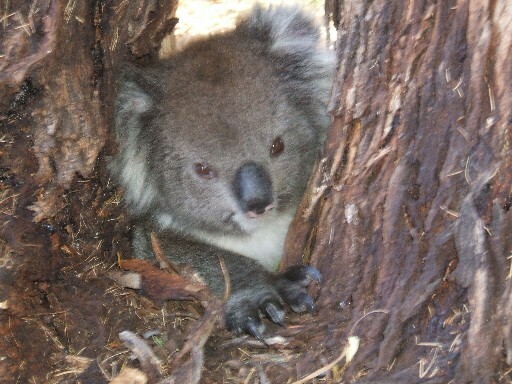 In January we saw a huge koala climbing a big gum tree just beside our garden shed. Our biggest news for January is Honey, our new cavoodle. Barbara brought her home on 3rd January. She is a cross between a miniature poodle, and a King Charles Spaniel. She is 7 inches tall and 13 inches long and 8 weeks old. 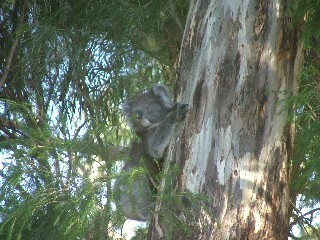 On right are 2 photos of the koala in our gum tree near our patio.